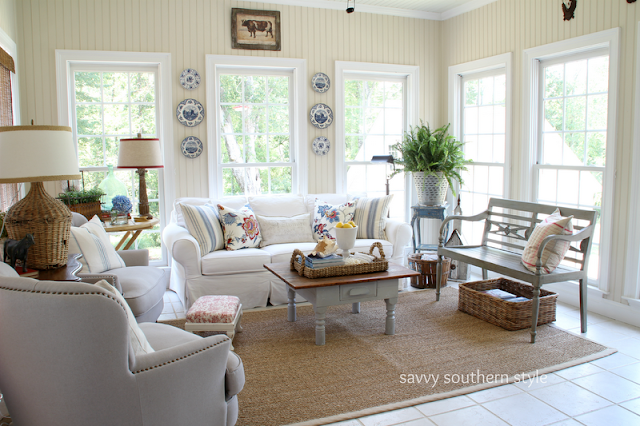 Today I'm sharing the sunroom and it's many changes the last few years. As many of you know this is my favorite room and it also serves as my office. Yes, this is where I blog daily. I can't remember the exact year we added this room on, but I would say around fifteen years ago. Our deck used to extend to the length of this sunroom and we really didn't need a deck that big. We added the sunroom because we couldn't see our spring fed pond from the house unless we went out to see it and we needed some storage for our yard equipment. Underneath the sunroom is a room enclosed to store all those things. Get ready for photo overload on this one. Click any of the highlighted links to see more. This is the way the sunroom looked the very first time I shared it in April 2010. The Pottery Barn sofa is the same one I still have only with a new slipcover. The two club chairs were my grandmother's that I inherited. They were in a chintz fabric that was very worn and I had the reupholstered in some fabric I could afford at the time. Those were two very well made chairs, but eventually I sold them. They were so low. I haven't seen any like those since. The walls were painted the same as the breakfast room at that time in Rosemary Sprig by Benjamin Moore. In October 2010 I shared the room dressed for fall. Different slipcover and a red rug were added. June 2011 the white slipcover was back on and a new sea grass rug was added. The red shutters in the corner are the shutters that hung out on the deck this summer. In January 2012 I decided to lighten up the room. I painted it in White Sand by Benjamin Moore. It is still this color. This is what the room looked like with the new wall color when I revealed it January 2012. April 2012 I bought the upholstered tufted chair from Overstock and it was the beginning of the chairs being switched up. In spring 2012 I started adding touches of blue and painted the t.v. cabinet with a variety of colors of chalk paint. June 2012 the new look with blues added. Oh, and I ordered another tufted chair. Fall 2012 the blues were removed and warmer greens and browns were added. This was one of my favorite looks. February 2013 shows the winter look. Furniture has changed a bit again and of course pillows are always changing. I still have every one of these pillows. They just move from room to room and in and out of storage. Since the sun room is my office where I blog I needed storage, but did not want a file cabinet. Now wouldn't that look good in here......not! This little chest was in our utility room off the garage and was holding basically junk. So I cleaned it out and painted it. Plaid is huge this year, but I was mad for plaid a couple years ago and I painted the table top red. I must have needed some more red in here so I painted the drop leaf table with some grain sack inspired stripes. I continued adding more blue by painting the end table in flow blue. I was in nesting overload in the spring 2014. I added the red checked drapes, swapped coffee tables and painted the end table again. Chairs started getting switched up when I found this Pottery Barn chair for sale at the outlet and it was too good of a deal to say no to. The room was then decorated for July in stars and stripes. After buying the striped chair the blue left the room and red, gray and black were the name of the game for a whole new look plus the red buffalo check curtains landed in here. Last month I shared how the room was styled for fall after finding these cool plaid pillows. There just may have been another pillow change in here and something added that I found at the Country Living Fair. Hopefully the sun will come out again soon, looks like not until next week, and I can take some pictures to share. Lately the sun room is not sunny. Your sun room is so lovely! Thanks for the tour. I so remember all of these looks....I remember thinking what a big job painting the sunroom was. I love the look now with the grays and reds. So much fun going down memory lane! Enjoying these looks back! Have a great day! It's so much fun to see the evolution of your rooms! Love all the changes from season to season. Thanks for sharing all of the changes in this beautiful room. It's nice to have kindred spirits out there who paint things over and over, like tables, etc...as I am always doing this! I love all the looks and especially love the wing chair that you purchased at Pottery Barn Outlet. It inspires me to have a wing chair reupholstered that has been just sitting in my basement. Love the fabric on it! I'm wondering if the woven shades that you had on your windows offered much privacy from the outside. I love this look but wonder if anyone could see in your room when the shades were drawn. I love how airy they look but also love the checked curtains you now have. Thanks for all the inspiration! Kim, Your sunroom is gorgeous, in all the years and in all the seasons! We had a screened porch at our other house and often talked about making it into a sunroom. When we bought our condo a couple of years ago, there weren't many to choose from and, unfortunately, ours doesn't have a sunroom :( I'll have to get my sunroom fix by looking and admiring yours. I love the bamboo shades, too! I was looking forward to this post. I have loved seeing all your other rooms evolve but this is my favorite. Each look is so perfect. It really proves that changing out a few things can really update the look of a room. I have White Sand paint in my foyer and you have inspired me with its versatility. Now let's hope for some sun! It's cloudy in NJ today as well. LOVE this room, Kim. It's always so cozy and comfortable! Kim the room is beautiful every way! I love the one that you said was a favorite!! Hi Kim, I think I love all the phases of your famous sun room! You are such a fabulous decorator! I love love love this room! What a great post too. I really enjoyed seeing the progression and each one is so pretty. It is amazing how much has changed. It has been fun seeing all the changes...love this room!